Named after Japanese American political activist, Yuri Kochiyama, the Cultural Center is a student-managed community space that supports cultural and educational events in conjunction with the UALRC. These events not only create a sense of community for Asian and Asian American students but they also serve to educate the campus about Asian and Asian American cultures. The Yuri Kochiyama Cultural Center (YKCC) Activity Room is housed in Worcester Dining Commons where it serves as a function room for events and other cultural activities. It is also used as an informal meeting place for students. Many activities are coordinated by the YKCC staff throughout the school year including the Annual Asian American Awareness Month. 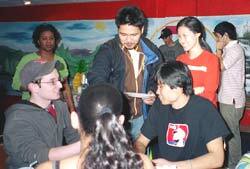 The YKCC encourages all Asian and Asian American students to become involved in its activities.